Some products offered for sale are subject to license or Home Office Authority. A copy of the customer’s appropriate license or specific authority must be provided prior to goods being sold. If goods are being exported, Shield, where appropriate, will apply for the necessary license from the UK competent authority. In support of this, customers must provide appropriate import and trading licensing paperwork for their country to enable Shield to make the application. An End User Undertaking [EUU] in the format acceptable to the UK issuing authority must also be provided. Payment in pounds sterling is to be received in full prior to despatch, unless otherwise agreed in writing. Purchaser to pay all bank charges. All major credit cards are accepted (telephone orders) or Paypal (website orders). Prices where quoted are FCA Shield (Incoterms 2010) i.e. shipping costs are excluded. Goods will be despatched by the most cost effective means, unless otherwise directed by the Customer. £5 postage will be added at check-out when purchasing via the website. Shield reserves the right to charge additional postage for shipping to addresses outside the UK if £5 is not sufficient to cover the cost. Prices may be subject to change from time to time, due to fluctuations in exchange rates or other influencing factors. Tax to be applied at the rate prevailing on the date of supply. Shield reserves the right to make changes to specification, without prior notice, except where goods are being supplied to a known and agreed Build Standard. Shield does not accept any liability for damage or injury of any description associated with the misuse of its product, whether intentional or unintentional; no liability can be accepted for any damage or injury caused by improper use or noncompliance with operating instructions provided. Force Majeure: Shield shall not be held responsible for delays in delivery or costs to the customer where circumstances beyond the reasonable control of Shield prevent it from carrying out its obligations to the client. Circumstances applicable shall include, without limitation, the following: i. Fire, flood, explosion, accident, war, strike, ii. Embargo, governmental or regulatory requirement, civil or military authority, Act of God, iii. Industrial disputes and acts or omissions of providers of utility services including telecommunications services. The above will be conducted according to English Law under the jurisdiction of the courts in England and Wales. Products sold where Shield is acting as agent for an Original Equipment Manufacturer [OEM] will be subject to the terms of the OEM’s warranty. Shield does not share any of its customers’ data with third parties. Data held by Shield is subject to the requirements of the Data Protection Act. 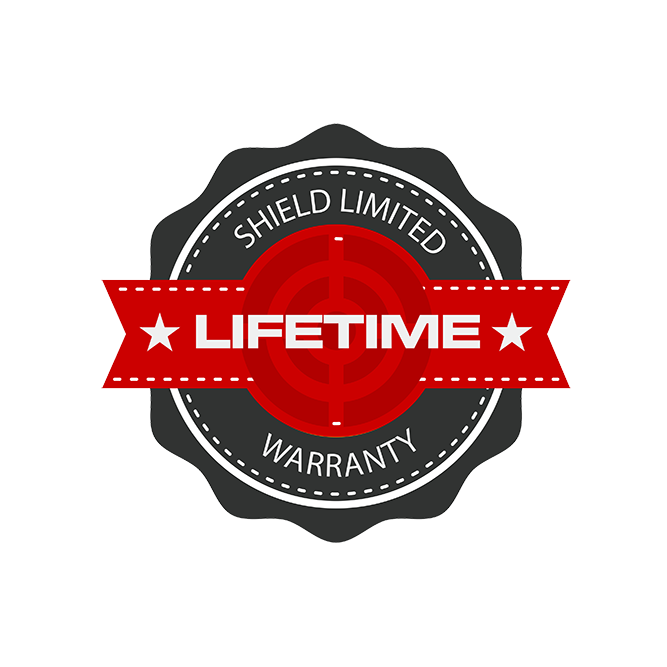 Products designed and manufactured by Shield carry a Limited Lifetime warranty on materials and workmanship. 7 year warranty on electronics. Goods being returned under warranty claim must be notified in writing, clearly stating: date of purchase, place of purchase, exact nature of the fault and claim, circumstances under which the fault occurred. Where Shield agrees to the return of the goods under warranty, it will either arrange for the goods to be collected at its own cost or agree to reimburse the customer all reasonable costs. This may include the supply of goods or service in lieu of a monetary value. Excluded from warranty are all consumable items [e.g. batteries], wear and tear. The Company reserves the right to refute claims where goods have been used for anything other than their intended purpose. If you have a question that is not answered here you can contact us via our contact form.